How great is that photograph? Just goes to show when women do well, we can get sport in the headlines. 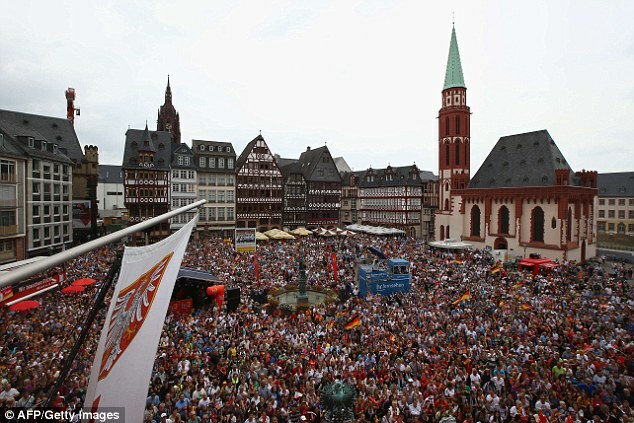 Over 5,000 people turned out in Frankfurt to welcome home the Women's EURO2013 champions. Good report on SpiegelOnline. Women's soccer burst onto the stage when Japan and the USA battled through tense penalties at the World Cup Final in 2011. Matches during London2012 got great coverage, and full stadiums - looks like the sport is on a roll. Cynical me remembers American Brandi Chastain getting a lot of attention with Those Abs back in 1999 - hopefully this time the interest will go further. I'd advise starting the video about 30 - 40 seconds it, there is a loooong build-up.